The Zither is a stringed instrument, having many strings stretched across a thin, wooden sound box. It is played by strumming or plucking the strings, either with fingers or with a plec. The Zither is most commonly found in Slovenia, Austria, Hungary, northwestern Croatia and the southern regions of Germany. The instrument became famous by its charismatic main theme "The 3rd man" of 1949 film noir played by Anton Karas. The Zither instrument we are presenting is a Concert Zither. The strings are arranged as follows: 5 fretted melody strings, placed above a guitar-like fretboard, then 14 unfretted "accompaniment" strings; followed by 11 unfretted "bass" strings and finally 6 "contrabass" strings. The concert Zither has a rough and raunchy sound often descibed as "mellow". We treated the Concert Zither very hard. We plucked, stroke and strummed all the strings to get every possible sound, noise and articulation the Zither can make. Finally we assembled 6 different patches. Firstly there are two the main patch with all the 36 strings recorded in 4 round robin variations and several (up to four) dynamic layer. We additionally recorded the 31 accompaniment strings in a muted variation. All these notes were recorded with two different types of microphones: a large-diaphragm condenser pair as well as a classic dynamic microphone. By turning a corresponding mic balance knob you can infinitely mix between these two different sound properties. Finally - in order to shape the sound - we added a complex script to achieve lots of different variations of the Concert Zither. By moving the mod wheel you can fade between vibrato and non-vibrato notes. Beside the main complex patches we provide another 4 useful FX patches, separated into textures, strokes & hits (with dynamic layers) and weird noises. Here you find a great assortment of rare and exceptional FX string sounds. 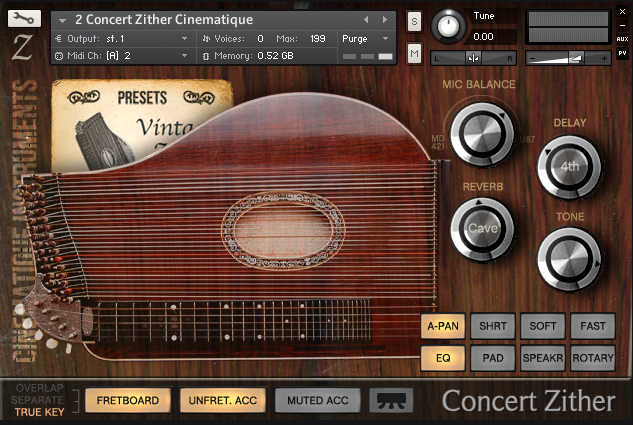 The Concert Zither is a perfect supplement to all the other Cinematique Strings instruments: rare and unique.